Is there no limit to how low Republicans will stoop to defend the gun culture? On October 8, 2015, in a transparent pandering to gun lovers and their lobbies, Republican presidential candidate Ben Carson made the shocking pronouncement that if the Jewish population of Germany had been armed "the Holocaust would have been less likely" -- an extension of the popular NRA dogma that an armed population is protection against criminals and despotic governments. 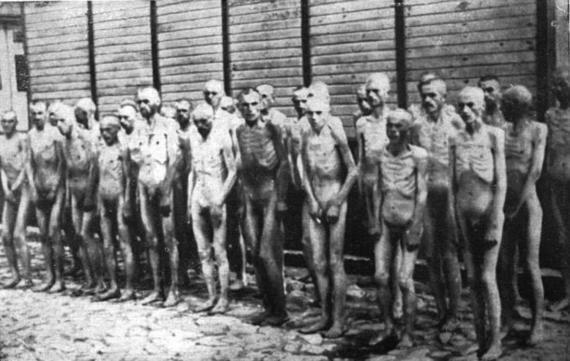 Carson's grotesque view of the Holocaust left me speechless. I thought he might have second thoughts about his statement after the public outcry. Taking the heat off Nazis for the Holocaust generally doesn't go over well. Nor does blaming the victims by suggesting that "they could have saved themselves if they had guns and mounted militaristic action." But in an interview on Meet the Press on October 25th, he continued to stand his ground. It's 1939, Berlin, when the Nazis stepped up the deportation of German Jews. Four Gestapo officers knock on the door of Abraham and Sarah Hoffman's apartment. The Hoffmans are ready. Abe, Sarah, their parents, and their four children saw the Nazis coming and are prepared. They are armed with revolvers and rifles. When the officers enter, the Hoffmans open fire, killing all four officers. But that's hardly the end of the story. Other German soldiers out on the street storm the apartment and quickly kill the Hoffmans. And when they enter the next apartment, they start shooting immediately; they can't afford to lose good men as they did in the Hoffmans' apartment. Even though the Hoffmans' neighbors are also armed, they are no match for the Nazis. Indeed, it's a matter of record that the Nazis responded viciously to the rare attacks of the sort the Hoffmans mounted. As reported in the Jewish Virtual Library, "If a Nazi soldier was murdered by a Jew, not only was that Jew executed, but also his family and perhaps a hundred others." As a result, many Jews were discouraged from active rebellion for fear of huge reprisals. But others did fight back. It might come as a surprise to Ben Carson that there were numerous armed Jewish insurgencies: in the Bialystok Ghetto, the Vilna Ghetto, the death camps Treblinka, Sobibor, Auschwitz, and more. In all these armed uprisings the courageous Jewish fighters were slaughtered. The Warsaw Ghetto insurgents had machine guns, hand grenades, rifles, and revolvers that were smuggled in by the Polish resistance. But they were up against 3,000 elite German troops with tanks, heavy artillery, and 7,000 German backup reinforcements; 15,000 Jews were killed and the survivors were sent to death camps. Now Carson might respond: "You underestimate me. That's not what I had in mind. When I said that the Holocaust would have been lessened if Jews were armed and fought back I meant an organized Jewish rebellion -- an insurgency of well-armed, well-trained, and prepared Jews, before they were rounded up and incarcerated in Ghettos and death camps." Without considering how exactly that could have happened -- not to mention the curious use of the word "lessened" -- there's a more crucial issue for Carson to ponder: arithmetic. In 1933, Jews represented less than one percent (0.75 percent) of the German population of 67 million. Later, there were fewer after many escaped from Germany and emigrated. Seventy percent of the remaining Jews were dispersed throughout the 10 largest cities. A good percentage of them were children and the elderly -- hardly the basis for an "organized Jewish rebellion." Consider too that the well-trained, fully armed, and professionally led armies of Poland, France, and other nations were not able to combat or "lessen" Hitler's invasion of their countries; the defeats were swift and brutal. Even the massive Russian army suffered devastating losses before it achieved victories. And when the United States entered the war in 1941, eventually mounting an army of 16 million, they faced a serious challenge against the Germans. America suffered heavy losses in a number of battles. It's highly unlikely that armed Jews would have done better than well-organized military establishments. It's also unlikely that, dispersed as they were, the Jews could have launched any kind of effective insurgency to alter the course of the Holocaust. But in Ben Carson's mind, two incontrovertible facts -- the Nazis' overwhelming military advantage and their superior numbers -- do not diminish his view that a relatively small number of armed Jewish accountants, physicians, teachers, shopkeepers, and other civilians would have "lessened" the Holocaust. More probable, an armed revolt would have led to the earlier killing of even more Jews than were eventually exterminated. And that might have included many of the Jewish scientists who later assembled in Los Alamos to help create an atomic bomb before Germany could develop one. Anyone looking at the big picture and the arithmetic problem should be as stunned as I was hearing Ben Carson's statement. If the public buys his thinking then we may be in more trouble than we ever imagined (as I write this he is number one among Republican candidates in the polls nationwide). Today, Jews have an effective strategy for defending themselves: a sovereign nation with a powerful military. Israel's mantra of "never again" speaks with solemn resolution to the atrocities of the past. Perhaps Ben Carson should think "never again" when he is inclined to spew his vile invective against the Jews of the Holocaust. Bernard Starr, PhD, is a psychologist and professor emeritus at the City University of New York (Brooklyn College). He is also the main United Nations representative for The Institute of Global Education (IGE) that founded Radio for Peace International and the Mucherla Global School in Mucherla India. IGE is an NGO with consultative status with the Economic and Social Council (ECOSOC) of the United Nations.